I tried after this some “what if” scenario’s which also exposes some of the extra possibilities the XQuery language adds to SQL to solve a query problem. The following is far from what all is possible, but I wanted to check what the Oracle Optimizer does or doesn’t pick up. The following also shows some room of improvement (enhancement request/ideas already posted to the guys in charge). The first alternative which came to mind was, “what if I bring everything into the XMLEXIST/XQuery section” of the statement and completely remove the date comparisons in the SQL section? This resulted in the following statement. notation is used, can be used, to add comment sections. It is also needed as its notation of “(::)” to signal programs like SQL*Plus to ignore the ” ; “-sign. 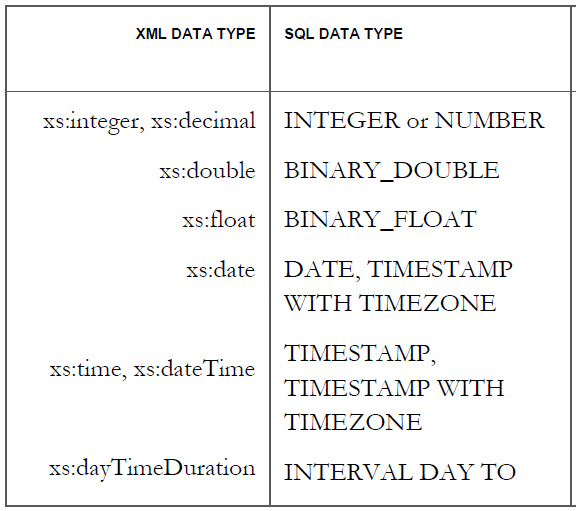 Be aware of the use of xs:date that is needed for date datatype comparison. Resulted in the same cost (794) and explain plan output as shown at the beginning of this post (and explained at the end of the first post). So no change via this approach. What if we make use of XMLQUERY functionality in the SELECT section? A short test shows no difference in the COST figure (still 794) and/or the explain plan output. Back to, more or less, our start figures. Total costs went up to 566783 instead of still being around the 794 figure. which can be cast via XMLCAST to a NUMBER(38) datatype. Anyway, something to be aware of if you want to take full advantage in a (11.2.0.3) database with XMLType Object Relational storage solution. I wasn’t (yet) able to test this on a different database version and/or, for example, on XMLType Securefile Binary XML storage. the above…just in case…, someone uses this kind of syntax in a production environment. Brings us back on what Oracle may do rewriting, under the covers, in the case of XMLType Object Relational storage, which are in essence “plain old database objects”. Can we optimize THIS used statement in database version 11.2.0.3.? When is an XQuery Statement too Long?